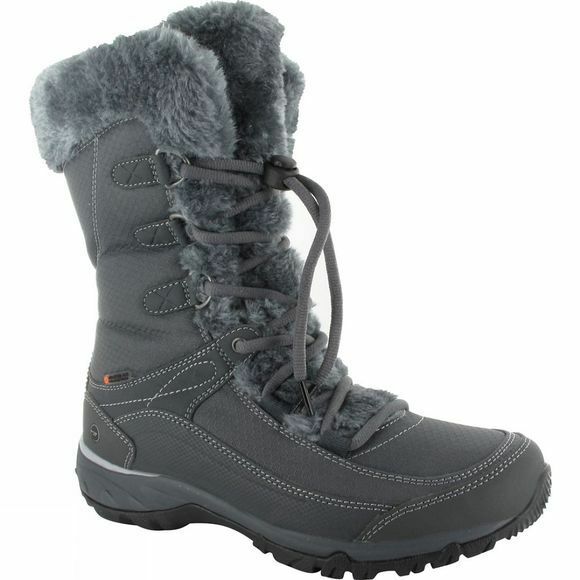 The Womens Equilibrio St Bijou 200 I Waterproof Boot from Hi-Tec are warm, comfy and snuggly. Featuring 200g Thinsulate Insulation, they trap in the heat without being bulky. They also have a Dri-Tec waterproof membrane to keep feet dry in wet conditions, plus the i-shield technology which repels water and dirt to prevent stains. On the inside, they have a micro-fleece moisture wicking lining, and slow recover Ortholite Impressions insoles for exceptional underfoot cushioning and comfort. The Multi-Directional Traction (MDT) outsole improves grip on uneven terrain. Exceptionally comfortable, insulated and waterproof to keep your feet warm, dry and grounded during the colder months. They look great worn over leggings or skinny jeans!